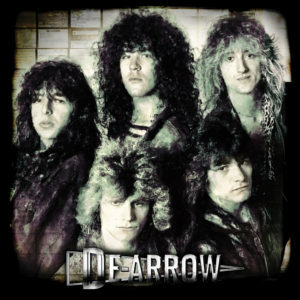 De-Arrow was an Australian 5-piece melodic rock band that existed from 1983 to 1989. The original line-up consisted of Lou Yarevski (vocals), Dragan Stanic (guitars), Noel Hart (keyboards), Paul (Jackie) Gleeson (bass), and Mick Djokic (drums). Later incarnations included Mick Kat (bass), Steve Kara (drums), with session vocals expertly handled by well-known Australian singers Adrian Campbell and Juno Roxas. Though it was the 1980s and big hair was de rigueur for hard rock bands, including De-Arrow, for these guys it was always more about the music rather than the image. Catchy hooks, chunky guitars with awesome solos, layered contemporary keyboards, huge drums, with a rock-God vocal line over the top. Along with radio-ready anthems, De-Arrow also presented longer epics with more complex arrangements. Some musical depth for those delving deeper. Ensconced in the underground cassette tape-trading circuit that was so prevalent during the 1980s, De-Arrow caught the attention of press and radio across the planet.